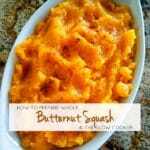 Slow Cooker Butternut Squash - no cutting, no peeling. This is quite possibly one of the easiest recipes you will ever prepare. Select a squash that will fit in your slow cooker (this is really important!). Wash the squash. Wrap in a double layer of foil and place in slow cooker. Cook on high for 4-5 hours or low for 6-7 hours. Actual time will vary based on the size of your squash and performance of your slow cooker. Test for doneness by inserting a sharp knife into the foil-wrapped squash. The knife should enter the squash without any resistance. Be very careful removing the squash from the slow cooker - it's hot & unstable. Place on cutting board, unwrap and discard foil. Cut the squash in half lengthwise. Remove the seeds & discard. Scrape out the squash with a spoon. Serving suggestion: serve with a little butter and nutmeg for an easy side dish. Store cooked squash in a covered container in the refrigerator. You can cook the squash without wrapping in foil. I prefer to wrap in foil because it's much easier to remove the cooked squash if it's wrapped. Use the cooked squash in your favorite recipes. I like to eat it with a little butter and a sprinkle of nutmeg or pumpkin pie spice. All nutritional information is intended for informational purposes only and should be used only as a general guideline. This information is provided as a courtesy and there is no guarantee that the information will be completely accurate.